There's shade for picnicking at the Pont. Constructed around 30 BC, it was used up until the 14th century, then partially dismantled and wrecked by flood waters. 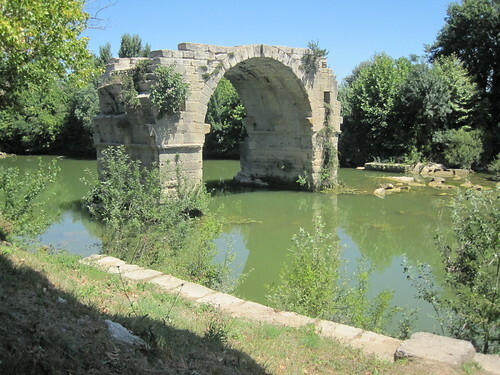 A long-gone embankment (my interpretation) connected this bridge to the nearby section of the Via Domitia. That's limestone, not the hardest rock in the world, but still those ruts attest to the traffic on this road (view from above here). 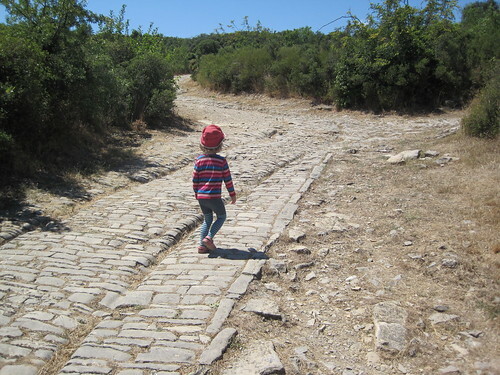 Uphill are found the remains of fortifications, buildings, a public edifice, and (best of all, in my daughter's opinion) a large patch of wild blackberries. Taking the same frontage road back to the D34 and A9 entrance, you'll pass a backdoor to an autoroute rest stop ("aire" en français). A stop there to slip through and get ice cream bars from the gas station boutique is highly recommended.